Veggie Protein Steak – Wheat find your fresh in the cooler of your health food store. 66% Manitoba wheat flour*, 17% wholemeal wheat flour*, 17% shoyu sauce*: shoyu* (water, soybeans*, wheat*, sea salt, aspergilus oryzae), ginger*, bay leaves* and fleur de sel. 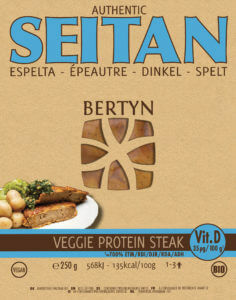 Een verpakking Bertyn Veggie Protein Seitan Tarwe steaks bevat 300 gram.